I’ll leave it to Dowdy to tell the story behind the pen — he wrote a great post in which he explains it all. But, in short, the design that wraps around the barrel is an illustration created by Matthew Morse, which is an homage to Yoshimi Battles the Pink Robots, the song and album by The Flaming Lips. If you haven’t heard it, I encourage you to check it out. It’s good! Morse’s design for the pen wrap is similar to the original Flaming Lips album cover, albeit in a totally different style. It depicts a young Japanese Girl, Yoshimi, wielding a long, pink sword, ready to do battle with a couple of giant pink robots. The twist, clip, and tip of the pen are a all black, and, on the disk inset at the top of the twist, the “pen addict” logo is centered inside a hot pink background. In my opinion, the best Tornado designs are the ones that adapt the work of artists, like the Bioworkz Edition and the Joey Feldman Edition, or the ones that tell a story, like the Tiger Shark or the Albert. This Pink Robots Edition manages to do both, which is probably why I like it so much. The bad news is that there were only 500 of these pens produced (I’ve got #156), and they sold out quickly. But with the success of this pen, there’s sure to be plenty of creative stuff coming next time Dowdy and Retro 1951 team up. In April of this year, Mike Dudek of The Clicky Post announced that he had collaborated with Retro 51 to create an exclusive Tornado. Called The System, the barrel of the pen features a stylized, overhead a map of the sun and planets in our solar system (plus Pluto) on a black background. The design looked awesome, so I had to get it. You may not be able to see it in the pictures, but The System also has glossy black (“dark matter”) strips curving across the barrel that add a little texture, making it a little nicer to hold. The clip, twist, and tip are painted black, and the disk inset at the top of the pen is colored a sun-bright orange. It doesn’t have any acid-etching or glow-in-the-dark elements like other recent Tornados, which may have worked well here too, but I still think it manages to be one of the best Tornado designs out there. It didn’t come without a small bit of drama, however. Initially 300 of these pens were produced, but this was described as an “open numbered edition,” which apparently confused a lot of people into thinking it was a “limited edition.” Like limited edition Tornados, each of these pens has a number stamped near the twist, but Dudek planned to keep making them as long as there was a demand. While I don’t fully understand the point, the “open numbered” concept really doesn’t upset me. After all, Retro 51 did the same thing with The Flying Tiger. Ultimately, a total of 1,300 pens were produced, and I think the only real angry people were the re-sellers. For my part, I’m just happy to have a cool pen. If you missed out on this one, it unfortunately doesn’t seem like Dudek plans to produce any more – though you can get still get the pencil version, if that’s your thing. But definitely keep an eye out for whatever he does in the future. I know I will. New York, New York. I’ve only visited a few times (and I’ll be going back later this year), but I know that it’s an amazing city – one that I love. 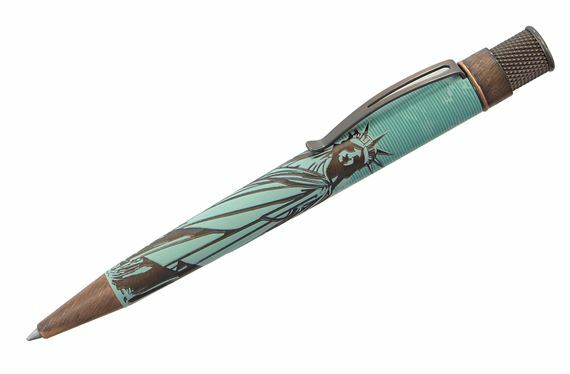 So when Goldspot Pens announced this NYC Skyline Retro 51 Tornado late last year, I immediately jumped on the pre-order train. 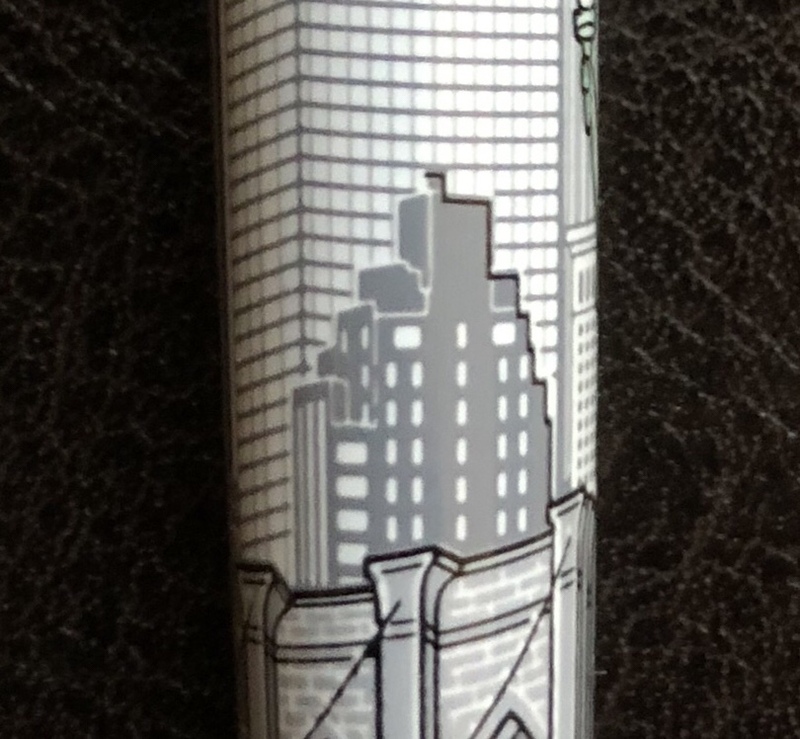 The NYC Skyline Edition is a standard Retro 51 Tornado in almost every way, except the barrel is wrapped with the iconic structures of New York City. The art includes the obvious and mandatory Statue of Liberty, Chrysler Building, Flatiron Building, and Empire State Building. But the barrel also shows off The Brooklyn Bridge, One World Trade Center (along with the 200 Vesey Street and 225 Liberty Street buildings nestled below), the Bank of America Tower, and the CitiGrooup Center. There’s even one building I can’t ID, but it looks like it could just be generic Manhattan offices. Another neat feature is the disc at the top of the pen, which features a logo reminiscent of the old NYC Transit tokens. Additionally, like a few other Tornadoes of late, the wrap glows in the dark. With this Skyline edition, however, the gimmick makes sense because it represents the city at night, which, frankly, looks cool. This is an amazing edition for anyone that loves New York City, but it was unfortunately limited to an odd 333 pieces. So, as you might have guessed, it’s already sold out. If you’re looking for something similar, the Statue of Liberty Tornado is still widely available, or Anderson Pens sells a Chicago Skyline Tornado. It also seems likely that Retro 51 will continue with this line. I can think of plenty that might come next… San Francisco? London? Paris? It will be interesting to see whatever it is. 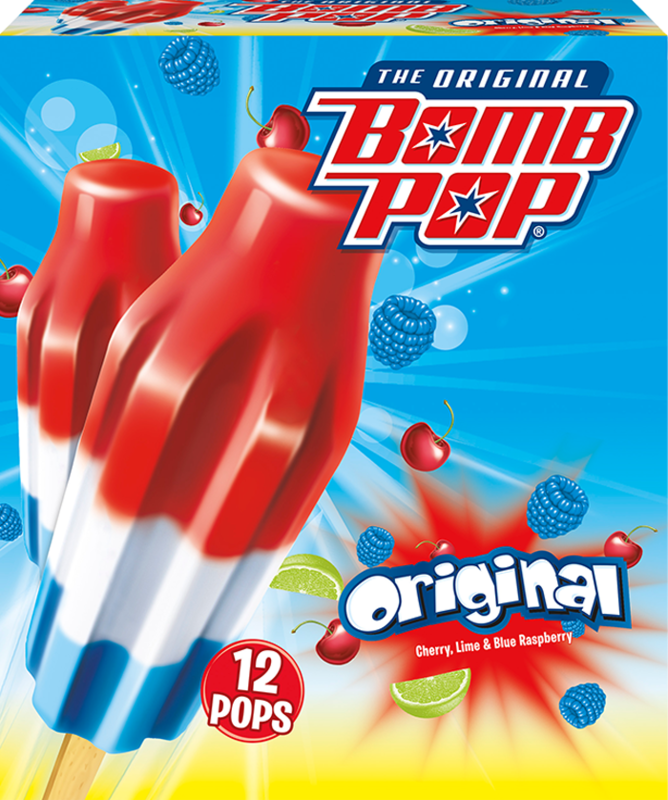 There may be no summertime dessert more iconic than the Bomb Pop – or, depending on your ice-cream truck guy, maybe it’s the Firecracker Popsicle. 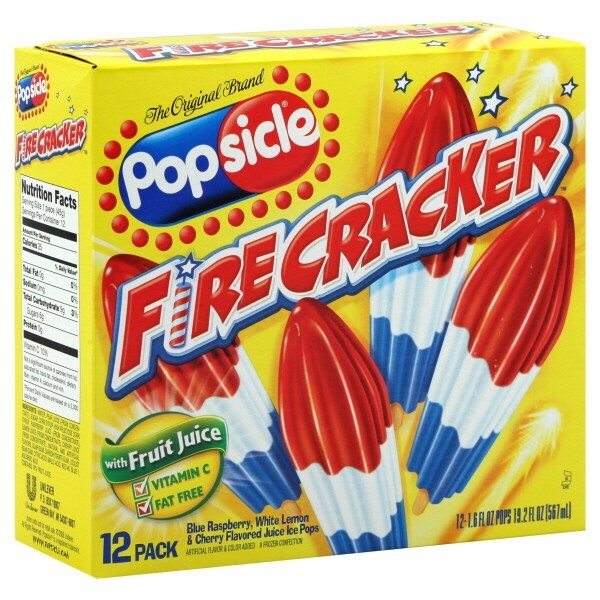 Either way, if you live in the United States, this dessert will probably conjure up memories of picnics, parks, and purple tongues. So maybe its no accident that this new Retro 51 Tornado, the Ice-O-Metric, was released in the dead of winter, when I find myself most nostalgic for memories of warm weather. The Ice-O-Metric design – an 8-bit depiction of the above-mentioned dessert – was created by Michael Jacobs, who wrote a fascinating blog post that details its inception and evolution (a worthwhile read for any aspiring graphic designers). Originally, the design was sold on a t-shirt, but it eventually made it to the Tornado via Brad Dowdy, who sells it on the Pen Addict website. Aside from the red, white, and blue ice pops wrapped diagonally along the barrel, there is a matching disc atop the twist mechanism, and, as a bonus gimmick, the pen also glows in the dark. It’s a great design, and an excellent sophomore Tornado release from The Pen Addict – the first being a more basic orange model. I’d say, get your hands on it if you can. It’s a limited edition of 600 pieces, and there’s apparently a risk that they’ll be run over by delivery trucks. At this point, it’s fair to say that I’m a Retro 51 Tornado addict. If I’m counting correctly, I believe I have a dozen of these pens, and I’ve bought a handful more to give as gifts. Tons of different designs are available, and it’s a great option if you’re thinking about upgrading your writing experience. And while many nicer pens go for $100 or more, you can get a Tornado for as little as $20. It also might be worth checking out the Slim Tornado line, which the company has been expanding lately. There are many great gel pens on the market, but the Pentel Energel is arguably the best. It’s durable, it’s comfortable, it has great ink, and it doesn’t cost a whole lot of money. This is really a great pen to have laying about in your work area, and it comes in a variety of colors and tip sizes. And if you really like this pen, you can get a stainless steel version for under $10. If you need a compact pen that can write in variety of situations, the Fisher Cap-O-Matic is the way to go. The pressurized Space Pen ink cartridge will write upside-down or on wet paper, if you need it to. Though, I still really like my Tombow Airpress, the slim, metal body of the Cap-O-Matic makes it a bit more pocket friendly. I’m constantly using porous point pens because they produce crisp and clean lines that make anybody’s handwriting look a little bit nicer. My new favorite: the Foray Stylemark. Its soft grip and good-quality clip are features that other porous points pens don’t typically have, making it the best one out there. But if you can’t find a Stylemark, the BIC Intensity comes in at a close second, and the Sharpie Pen will do in a pinch. Fountain pens are typically perceived as finicky, old fashioned devices, yet there’s still a large market for them because they provide such a unique and interesting writing experience. So if you or someone you know is looking to try one out, you can’t do much better than the TSBI Eco. It’s about $30, which is rather inexpensive for a fountain pen, and it looks great, writes great, plus it’s easy to use. It’s available in various nib sizes and styles, though I have to say that the stub nib is pretty killer. So there’s a handful of pens for you to check out. If you have any questions or concerns, feel free to email me at atb@pensandjunk.com or just leave a comment below.